Isaac Davis ’20 has been making films for a long time, but this one has special meaning to him. It was inspired by — and is dedicated to — John Van Bergen, a friend of Davis’ who died by suicide at the beginning of 2018. “The best way I kind of knew how to honor him and honor his story was to center a film that was inspired by him,” said Davis. 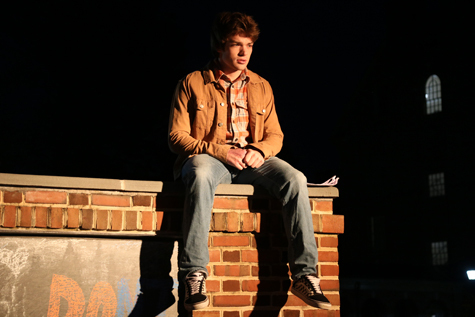 A film and media studies major at William & Mary, Davis produced the short film “Solo Orange” with 19 other William & Mary students over the course of the last year. It will premiere in the Sadler Center’s Commonwealth Auditorium on Sunday, March 24 at 3:30 p.m. Tickets are $5 and are available online or at tables in the Sadler Center during select times. The production has been supported by numerous businesses in the local area as well as staff in the McLeod Tyler Wellness Center at W&M. According to Davis, “Solo Orange” is the first professional short film at W&M to be created in conjunction with a production company and shot in 4K, the same film quality of today’s major motion pictures. The production company? Davis’ own, Identity Production Studios LLC , which he started while in middle school. Davis became interesting in filmmaking when he was just a child, inspired by animated films produced by Disney and Dreamworks, including “The Prince of Egypt,” which made a particular impact on Davis as the son of a Baptist pastor. “That kind of got me attuned to what filmmaking is and how to tell a story visually on screen,” he said. In 2011, he joined with other students who were passionate about filmmaking to start his production company, and over the next six years, they took every opportunity to learn about all aspects of the craft. In 2017, the production company became official, and Davis decided to focus on honing his skills as a director. Davis became friends with Van Bergen — the son of two W&M alumni, Jamie ’85 and Peter Van Bergen J.D. ’86 — when they both were in 5th grade. Van Bergen, too, had an interest in film, and the two friends planned on pursuing careers in filmmaking together, with Van Bergen studying at Virginia Commonwealth University and Davis at W&M. According to a Virginia Gazette obituary, Van Bergen interned at the Kimball Theatre during his senior year of high school and, while there, worked on cataloging and researching foreign and independent films — an experience he cherished. He was also a gifted photographer, had a deep passion for music and independent artists and received a merit scholarship to pursue his love of the arts. When Van Bergen died, Davis decided he wanted to honor his friend by helping others learn about anxiety and depression. That’s how “Solo Orange” was conceived. The short film, written by two W&M students and acted by four others, highlights the internal and external conversations that a person experiencing anxiety or depression may have. A total of 20 W&M students made up the cast and crew of the film and helped with everything from pre-production to cinematography to sound mixing, Davis said. “For me, it’s even more fulfilling because this is a story that is by students for students, so that just really brings it home,” he said. Because the crew members set high goals for the quality of the film, they also faced several challenges. For instance, one student, Carter Bruck ’22, had to design a system that could edit the 4K film. He also was responsible for finding sound equipment and mixing the sound so that it would “come alive on screen,” said Davis. The topic of the film and long production schedule were also challenging for the cast and crew, causing emotional strain for many of those involved. That caused Davis to grow as a director and think about not only filming but providing for the other needs of the cast and crew, too. 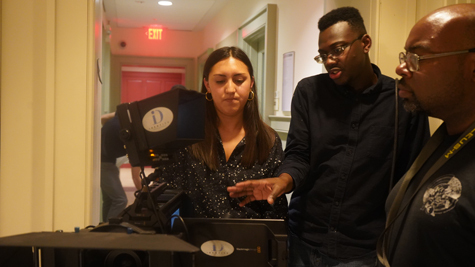 In addition to the upcoming premiere at W&M, Davis has been working with Kelly and others to have the film shown in other locations, including other colleges and universities. Davis also wants to submit the film to the College Academy Awards. But what Davis really hopes is that people who see the film walk away inspired to take action. “To be more mindful of all of the people around you, to ask certain questions, to check up on someone, to make sure we’re really paying attention and supporting each other,” he said.